Just got in from a lovely hike along the ridge, down the north face broadside and into the bottomland armed with a garden hand spade and my two trusty dogs. Who are not particularly known to be good truffle-sniffers, and wouldn’t know a morel if it bit ‘em on the nose, but who can definitely sniff out some stinky ramps without any trouble at all. Who can’t? They’re not up in clumps yet, but the leaders are poking up through the dried and matted leaf mulch from last fall. I dug just enough for ramp scrambled eggs for grandson and I, marked the rest with those little day-glo surveyor’s flags on wire for harvesting in a few weeks when everything’s green-green and they’d be hard to find. Ramps, also known as wild leeks, are wild, forest grown alliums related to onions, leeks and garlic. Their foliage is broad and pretty, red-tinged toward the ground. They grow from South Carolina north to Canada, and are considered quite the spring delicacy here in the mountains where spring Ramp Festivals through North Carolina, Tennessee, Kentucky, West Virginia and Virginia are very popular. Like with garlic, if everybody’s got ramp-breath it’s not nearly so offensive. And ramp lovers are known to scarf them down by the bunch. Now, I’ll be chopping, partially drying and then freezing most of my ramps in anticipation of morels when they show up, as sliced morels and ramps sauteed in butter is just beyond believable as Super Taste Treat Sensations go. Use the bulb, stems and about half of the leaves. Some people love them best with eggs, in potato soup or in wish fried potatoes and peppers. They’re good any way you care to cook them, but if you’re the only one in the family eating them you may find the family giving you wide berth for a few days as the odor lingers. 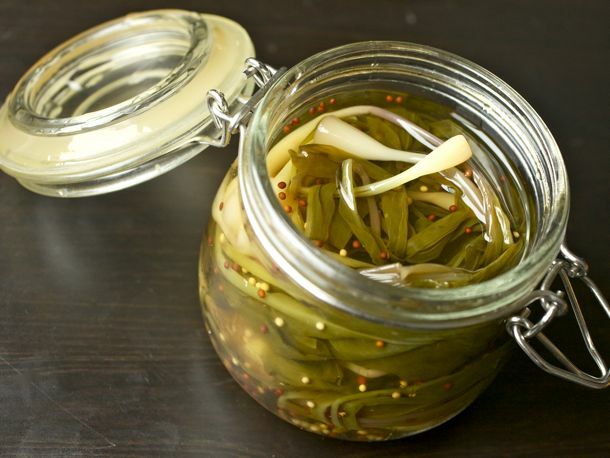 I have even heard tell of pickled ramps! These delicate and incredibly tasty little leek-onion-garlic things are not grown commercially, though there are farms in the high country that have encouraged ramp crops in abundance in the same type of mulchy forest loam that grows good ginseng and other wild medicinals, and morels. They’re only available in the spring, April and early May around these parts. I don’t harvest for the local festival, as my ramps aren’t abundant enough for that and we love them far too much ourselves. It’s sort of like ginseng or morels… if you’ve got a good woodland patch, you don’t tell people about it or they’ll clean you out when you aren’t looking. There are enough, however, to satisfy our need for spring tonic from the land, and the morels will be in about the same time judging from how fast this early-early spring is turning into hot-hot summer. Everything’s in overdrive. So perhaps we’ll have morels and ramps for the grandkids coming for Easter treats, who knows? Previous Previous post: ALERT! Pie Crust Update!